The diagram on the left is a graphical representation of the progression of the 90 quadrations as they occur over time. The layout is meant only to provide a framework from which to discuss the idea of studying the complete set of quadrations as a whole. The first thing to notice is that the years 89 and 44 quadrations are set in the middle. The next distinct factor here is that there are 2 sets of quadrations, one set inside of the other. Metaphorically, the binary state sets of cards reflect the phenomena of an alternating sequence of attraction operating in the universe, which can be represented as positive and negative aspects of the same force. This essentially reduces the total number of progressions from 90 to 45. 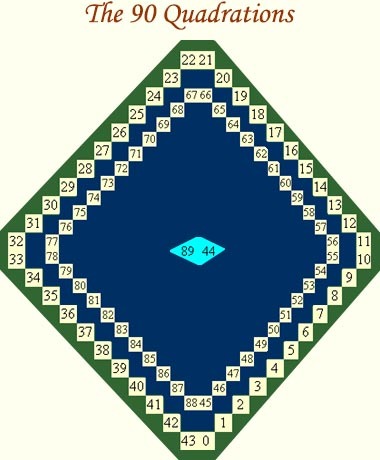 The 89 and 44 quadrations in the middle represent the union of the binary state sets of cards. The only difference between the year 89 and 44 quadrations is that in the year 44 quadration, the and the have changed houses as have the and changed houses. Other than that they are exactly the same. This holds true for all sets of quadrations which are 45 years apart. For instance, the year 0 and year 45 quadrations are the same except as explained above. That is the reason for the inner and outer circles of quadrations in the diagram. It is promoting the idea that we can look at these pairs of quadrations (i.e. years 0 and 45) as a union. Lets talk a little about the fixed and binary state cards. The , , and are all fixed cards. They do not change houses regardless of how many times you quadrate the deck. The and are binary state cards as are the and . In every other quadration of the deck they are in their partner's house. Since year 0 is the first quadratic grand spread, and the binary state cards have changed houses (compared to the sun spread), on all even years the binary state cards will be in their partner's house. On all odd years they will be in their original house. When we create a union of each set of these binary state cards, each set will rule 2 houses where one will dominate and the other will be subordinate. But since they are always changing houses, they really work in union. Now let's discuss the 2 quadrations in the middle of the graphic, the years 89 and 44. Certainly we will view them as a union, but what is the significance of them in the center of the layout? First, you will remember that the year 89 spread is also the sun spread for each person. The sun spread represents the Natural Order book, and as such cannot be compared equally to any other spread. It is the representation of pure potential, of the grace which drives both the sympathetic and parasympathetic systems in our body. It acts as the balance between the outer and the inner. It holds the space in the middle between the Rising and the Moon, and in all readings retains that same position. The geometry of this system is both simple and elegant, as the symmetry can bee seen in so many aspects of the workings of these cards. As we saw earlier, using the Karmic Wheel you could find your moon card and rising card just by finding the cards of the left and right of the individual Sun card. That occurs exactly at the 1st quadration. On the 2nd quadration, you look 2 to the right and 2 to the left for your moon card and rising card for that year (year 1). This continues on for 45 quadrations, where it starts over again. What this means is that the year 88 quadration is the moon spread to the year 0 quadration which is Rising. When year 1 is Rising, the year 87 quadration is Moon. Each time you perform a reading for a client, you put the rising spread on one side, the sun spread in the middle, and the moon spread on the opposite side. Readings always incorporate the rising spread, sun spread and moon spread in order to balance the outward energy of that which is Rising with the underlying or Moon energy which called it forth. The Sun retains its position as equalizer, grace provider, balancer, etc. By creating a union of the binary state cards, essentially what we have done is decreased the number of progressions from 90 to 45. Then, by removing the years 44 and 89 spreads from the cycle and placing it in the middle, we have reduced the number to 44. Finally, by always analyzing the sun spread, rising spread and moon spread together, we have reduced the number of unique Oracles to 22.